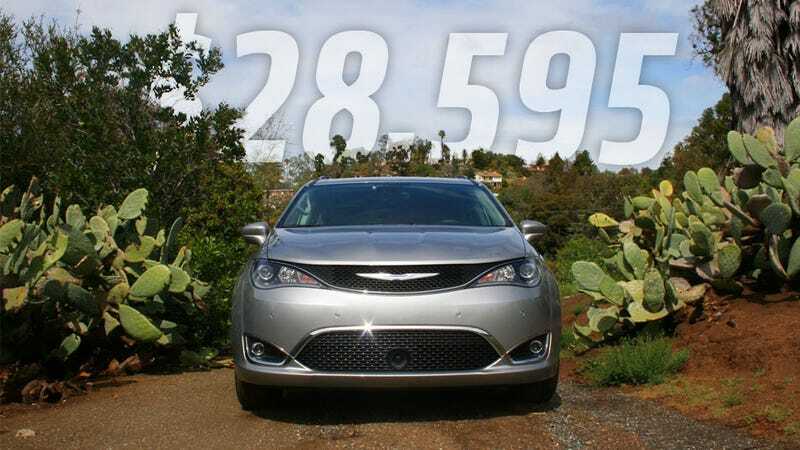 I just got back from the lavish 2017 Chrysler Pacifica first-drive event, and while I’m embargoed from talking in too much detail about the car or how it drives just yet, I can tell you how much it’ll cost: between $28,595 and $42,495. While I can’t really discuss this in too much detail yet, I will say that these prices strike me as pretty good for the amount of minivan you get, and with a price spread of around ten grand, there’s a lot of ways to spec these things. Sorry about the screen refresh line there. Remember when LX meant the luxury spec, and there were things like DX for the stripper cars? Nothing makes sense anymore. Anyway, the LX is pretty well spec’d, but there’s some big stuff that will probably make most people pass over the entry-level one for at least the next one up, most notably the power sliding side doors, which everyone thinks are pretty cool. That’s half the fun of a modern minivan right there! Other big features for the Pacifica, like the much-touted UConnect Theater, with it’s three big screens and all those apps and whatnot, don’t come until the Touring-L Plus spec, and if you want the integrated vacuum cleaner (I mean, why wouldn’t you? ), you have to go all the way to the top spec. At least for now. It’s been hinted that down the road such desirable features like the vacuum might be available as an option on lesser spec Pacificas. Also notable is that for the very low-end, Chrysler still has their Dodge minivan, though it was suggested that at the end of that car’s lifecycle (coming soon!) a new, lower-spec Pacifica-based van will take its place. There’s lots more to talk about on this car, but we’ll just have to wait a couple weeks so I don’t piss off Uncle Chrysler, who just showed me such a nice time and pretended to be interested in me. Stay tuned.